The business that was broken into. Image supplied by SAPS. The men attempted to steal batteries, oils, and accessories and then place the goods in trolleys to take home. 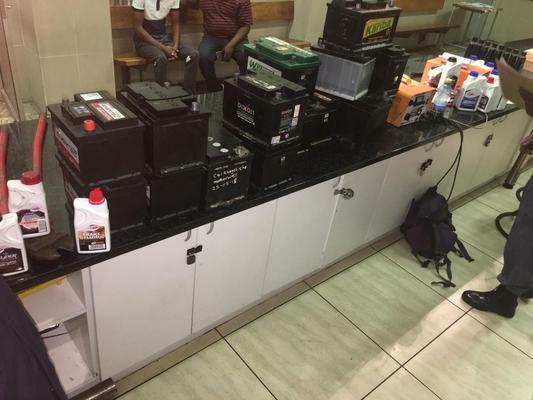 Police in Port Elizabeth, Eastern Cape, arrested three men who allegedly stole 15 car batteries from a business in North End during the early hours of Friday morning. Police spokesperson Colonel Priscilla Naidu said the three suspects entered the premises shortly after midnight, and a short while later police received information about two suspicious men who were pushing two trolleys in Central. While driving, the police were stopped by the business owner who informed them the premises had been broken into. The business owner then accompanied police in looking for the suspects. Police tracked them down in Robert Street where the complainant identified his stolen goods. Naidu said the two men were in possession of 15 vehicle batteries as well as various types of oils and accessories which had been placed in the trolleys. While police were busy with the suspects, a third man approached them and was also arrested. The three men, between the ages of 24 and 32, were detained for housebreaking and possession of suspected stolen property. They are expected to appear in court soon.